“Words are powerful. They shape the way we see the world around us. “Both the cut line and the headline do not state what happened, which is that the driver of the car opened the door in the face of the cyclist. The parked car did not suddenly open; the cyclist did not run into an object that was sitting there in her path; she was killed by the action of a person, the driver of a vehicle. 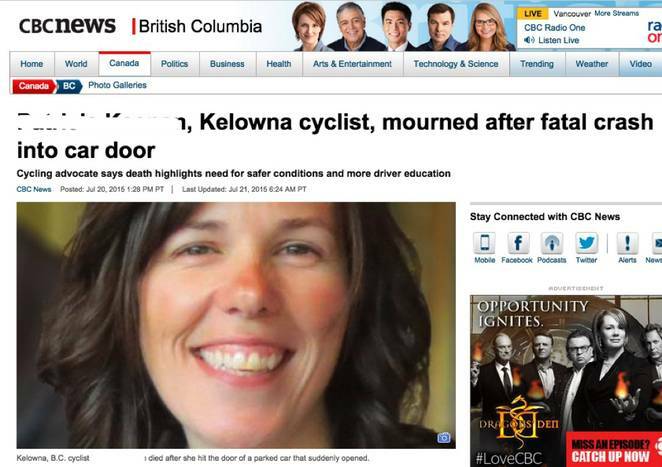 Driver opens car door in front of 38 year old mother on a bicycle, killing her. Read how to avoid killing a cyclist with your car door at Treehugger: More on why words matter: Deconstructing a headline.